It was 40 minutes to the parade and the homemade boat float wasn’t finished. He was painting it in ‘Forest Green’ weatherproof paint with one hand while taking part in a tele-conference call to the US with the other. I threw him an exasperated stare. ‘See you down there’ I mumbled while hoisting Tigger, Simba and an 18-month-old pink butterfly into their car seats. That year the Humpty Dumpty Mother and Toddler Group had decided to take part in the Bray Saint Patrick’s Day Parade. The committee had given it an enthusiastic ‘green’ light. We were always looking for ways to reach out to new mothers, to gain exposure in the local community. At the starting point, there was chaos and angst. My three under-fives tore off their costumes and took fright at the belly dancers and the freaky faced clown on stilts. Stationed finally behind the Humpty Dumpty banner we were given the signal for the off. 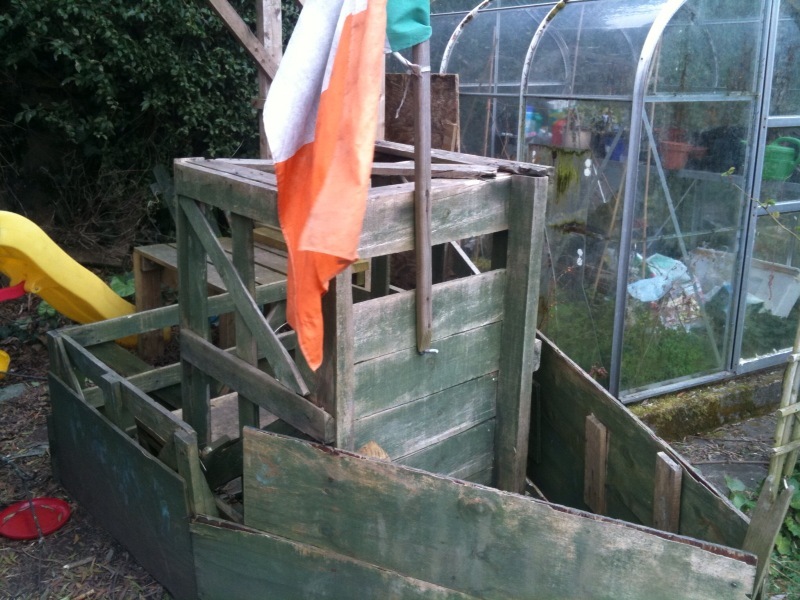 I began to realise that my husband’s creation of a fishing boat out of palettes and scrap wood may have been over-ambitious. He had attached castors to the underside in order to wheel the boat through the town to join us, but there was no sign of him. I sighed resignedly and set off with two kids on the buggy and one under my arm. Resignation turned to delight as Novara Road met Bray Main Street. He was there, waiting to join us. The former Tigger jumped in, eager for a ride in Daddy’s masterpiece. What should have been a happy conclusion was only the beginning of our troubles. Instead of moving at a stately pace, the parade began to race along. When my husband attempted to move the heavy boat, he stalled and we zipped by. He was sandwiched and stranded between a marching band and Bray Emmets. When he tells the story, he says I abandoned him. I say I thought he would catch up and take his place under the Humpty Dumpty banner. He says ‘at least someone else tried to help him’ — even though she yanked off the side of the boat in the endeavour. It was at that moment that he was filmed for the six o’ clock news making ‘running repairs’. The noteworthy point; always take your hammer on parade. When I said that the Humpty Dumpty group wanted exposure, I didn’t mean hypothermia. The year before we’d been sunburnt, this year threatened frostbite. As we flung ourselves back off the main street onto the Quinnsboro Road, the wind whipped up from the seafront. The children began to turn blue. It was then that a Garda in radio contact ceremoniously approached the group. A 3-year-old boy travelling in a homemade boat some way behind was hysterically calling for his mother. I ditched the toddler group and about turned. My husband was struggling, red faced and panting, flanked on each side by belly dancers. At my approach the former Tigger stopped screaming. We loaded all the children into the boat and soldiered on, side by side, our own private parade, our own Pole expedition. Sleet drove into our faces, but we prevailed, we saw the shore swim into view beyond the Dart lines, the waves recklessly pounding, the spray soaring. All we had to do was reach the seafront and the parade’s end. Alison, one has to admire the creativity here 😉 That said, I hope that THIS St. Patrick’s Day was a little less stressful, even if a bit less creative! good for you! a truly heroic endeavor! i love how the boat lives on and is part of the grand adventures to come from the young ones!